Pine Cone Collection includes 6 different pine cone designs (3 thin and 3 round). Each cone is worked in one piece, with a clever, easy-to-memorize stitch pattern that results in highly realistic pine cones with perfectly offset scales. Make realistic pine cones in any shades of brown, or make beautiful pine cone decorations in any colour to match your decor. Pile them in a bowl or vase, make them into a wreath, hang them from your Christmas tree, or string them into a garland. The pattern also includes modifications that will enable you to make cones of any size, with the same overlapping scale pattern. Date Added: 01/11/2018 by Monica B. Date Added: 12/20/2017 by Alice Y. 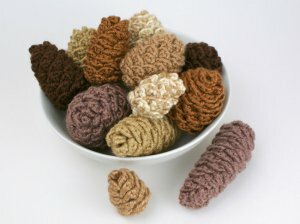 This is the best crochet pinecone there is! Date Added: 11/15/2017 by Rachelle Y. Date Added: 11/24/2014 by Andrea M.
Date Added: 08/22/2014 by Jenna C.
Date Added: 12/16/2012 by Aleksandra S.
Date Added: 12/12/2012 by Margaret K.
Date Added: 11/29/2012 by Carrolyn A. Date Added: 10/21/2012 by Monica B.